They are so beautiful and, dare I say it... peaceful! Beautiful! I love both of your entries. And I love your definition of peace. Sometimes I think that is the only way we can achieve peace! Love your key to peace! Lovely words to live by. I didn't enter this week but I'd like you to know that we have the same wishes. Beautiful! 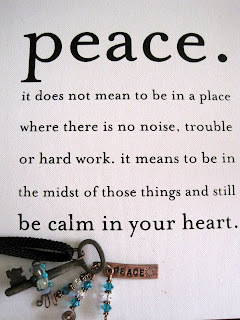 I love both entries and your definition of peace.I wish this as well for everyone. SO true- great interpretation of the theme! Wow ... I love the key and all of it's adornments ... and the message ... well, it's the perfect idea to wish on. Very nicely done!